"If there is an enthusiast, there is a monument. If there isn't one, then there is no monument"
"In Russia I think at the present time there is only one measure for political events: whether blood will be shed or not. Unfortunately, we are on the threshold of these events." On 28th March Index on Censorship, which has just celebrated its 40th anniversary, awarded one of its Freedom of Expression awards to Memorial Research and Information Centre. 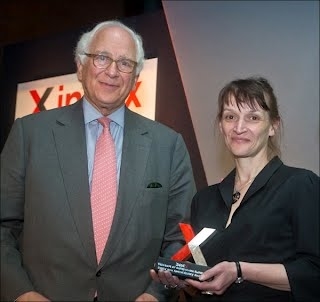 Irina Flige, director of the Centre in St. Petersburg, was presented with the award in London by Sir Evelyn de Rothschild, one of Index on Censorship’s original trustees (photo below: Index on Censorship). In this interview with Masha Karp, Irina Flige speaks about the work of the Centre, the protests that have taken place in Russia, and the current situation in Russia. Masha Karp Why do you think you received the award? Irina Flige I think that is a question for Index rather than for me, but in their invitation to the ceremony they explained that they were making the award for two of our projects: our Archive and our Virtual GULAG Museum. The idea of this project is to put up on the Net and make accessible to everybody a huge archive of documents and data that has been collected by St Petersburg Memorial, or rather by its Research and Information Centre, over the last twenty years. The Virtual Museum of Gulag started in 2004 and has been developing rather slowly, because it requires a lot of work and a lot of money. The idea of the project was to collect material on the GULAG from all the museums in the country that deal with this theme. When we started we did not even know how many museums of this kind existed. It was this curiosity that made us start the project. In 2003-2004 we all felt that we had been working for so many years and there was still no museum on the GULAG as at the end of the 1980s we had dreamt there would be, when we first started going out to rallies and organising “weeks of conscience”. We said then: We need a museum about the Gulag, we need a monument to the victims of terror, we need to know their names, we need to know the names of those who tried to resist. In 1987-89 there was a general feeling that the transformation of the country that we all wanted so much to happen would not be possible unless we addressed our past, unless we understood what the Terror was and what the GULAG was. At that point it was a mass movement, which united those who had been to the GULAG, or whose parents had been there, and those who had been trying to fight the Soviet regime. It united the emerging politicians and ordinary citizens. Everybody believed that understanding the past was a necessary condition for the country to change. But this did not last long. By 1993 the theme of the Terror and the GULAG had become marginalized. What remained from the movement of this time were Memorial organisations all over the country – there are 60 of them today. This is not a small network. And there are organisations outside Russia – in Germany, Italy, France, Latvia, Ukraine, partner groups in Kazakhstan. But the work was marginalized, that is, it was mainly carried out by enthusiasts very often on the basis of local museums, libraries and school clubs. So it went on for decades: some exhibitions were mounted, some materials collected, some interviews recorded, some monuments erected. The monuments were of necessity very simple – there has not been any funding for them. They were put up on the outskirts of towns and villages. In the last twenty years over a hundred monuments have been erected at the sites of mass burials. These were places where people were shot, GULAG cemeteries and cemeteries of special settlements. Today they sometimes look like monuments in the middle of nowhere – memory pushed to the margins of consciousness, so to speak. MK I’d like to ask you at this point: did you feel any support from government? IF No, the government had nothing to do with it. The Federal authorities never supported it at all. On the local level it was different. Some mayor or some governor of some tiny region could be quite interested in the idea and could be supportive at his level of government – we know several cases like that. Behind every monument, every museum, every newly-discovered mass grave, there is always an initiative by one person. If there is an enthusiast, there is a monument. If there isn't one, then there is no monument. It has nothing to do with education or status. Sometimes this enthusiast could be the head of a local government body. But can you call him a representative of the state? He just has a few more opportunities to do something, so he puts up not just a small stone on the mass grave, but something more decent in terms of size or location. So in 2003-4 the idea of creating a virtual museum of the GULAG originated from a research interest. We kept saying: there’s nothing done, we need at least to get an idea of what exists out there. So in 2004 we went on our first reconnaissance expedition and started a widespread monitoring. Then we found out that there were quite a few museums. Among the museums that deal with this theme, some exhibited their materials, others kept them in storage, and others did both. And it was then that we decided to create a virtual museum. MK You are saying there are quite a few museums. How many? IF In the summer of 2011 there were over 400 GULAG museums in Russia. We also work outside Russia. It’s impossible to explain why in some places there are a lot of museums and in some there are none. In Estonia there is one, in Latvia there is one and in Lithuania there are 12. This is mostly accidental – it depends on funding, it depends on partners, it depends on how much material has been sent from this or that place. Our project takes a lot of time, and to make it move faster and be more evenly spread, the funding really needs to be on an entirely different level. Not just a bit more money, but funding should be on a different scale entirely. For example, we only managed to organise a trip to Kolyma in 2011. We knew it would have to be a major expedition of many weeks, so we kept putting it off until we had enough funding. So what is the project about? We visit all these museums, take photos of the exhibits, discuss how we can deal with the information – sometimes there are descriptions of the exhibits, sometimes they are missing, so we prepare them ourselves. We get some additional materials, get the biographies. So in the last few years we have created a full catalogue of 120 museums with images on-line. This is one aspect of our work. Another aspect concerns the burial places of the Stalin terror. At the end of the 1980s all at the same time a lot of search groups were created. Children were looking for the graves of their parents who had died in the GULAG, and quite often their searches were successful, although they did not make any use of the archives, but only the testimonies of witnesses. So all the efforts of the Soviet authorities to conceal the places of execution proved to be in vain. In the 1990s those who had been alive at the time of these events - who could show this is where the lorries came, this is where the people were shot - were still alive. At the end of the 1980s and the beginning of the 1990s there was a huge effort to find the locations of mass burials and the places of execution. But by the beginning of 2000s these newly–found sites of mass burials had been lost. Even those that had been marked by signs were lost for a second time! Just imagine: a place was found, flowers brought, a cross or a stone was put up, people came and held vigils in memory of those who were buried there. But then this generation passed on and a new generation forgot the way to these sites – both literally and metaphorically. Why did this happen? Because these sites were never given any official status as memorials or historical places, so if a road was built across the area or something else happened, there was nothing to protect them. MK What is needed for them to acquire this status? IF Good will. The good will of government. MK Which is not there? IF Which is not there. Well, it is not that something is actively done to oppose this. It is just passive indifference. The monuments are there, but if for example something wooden gets burnt down, nobody has any responsibility for it and nobody has to restore it. And there is another aspect to our work. A virtual museum has advantages over a real one – there is no pressure of space. And this is why we added a new appendix to the museum: “Traces of the GULAG and Terror”. These are our “out-of–museum” exhibits – things such as an abandoned train, for example. You can’t really bring it into any real museum! But everything is possible with a virtual museum. So in this part of the museum we “collect” prisons and the offices of the secret police (the Cheka – NKVD - KGB). These buildings do not have any memorial plaques or any information about the numbers of people shot there. There are also mines and bridges and roads built by prisoners, GULAG factories, remainders of prison watch towers in the taiga and the tundra. Naturally we describe all of them and give detailed information about the reality behind these “exhibits”. This is still very much an academic site – we have not yet turned it into a real museum with tours or exhibitions. However, we have one virtual tour. It’s called “People and Objects”. There are simple things appearing on the screen – a bowl, a spoon, a hacksaw…. And then these objects start speaking with the voices of those who left memoirs. Quotations are read about these things – the squeaking door of a cell, the horror a woman experienced when she saw a spyhole in the prison door, a bowl bringing back memories of hunger... We know that this part of our site is widely used by teachers, journalists, and film directors. And one more thing that we do. After the search by the authorities that took place in 2009 and resulted in the seizure of our electronic archives, which had about 700 recordings of testimonies, digitalized memoirs and all the original materials on 12 hard drives, we started systematically to digitalize our paper archives. This is again a very labour intensive project – we started in 2009 and have done a quarter of the archive by now. MK But you got everything returned to you in the end, didn’t you? IF Yes we did. The court hearings lasted six months, but we got everything back. Now you can access our database remotely and when researchers approach us we allow them access. We have now been joined by Memorial in Ryazan – they are digitalizing their collection and putting it into the same database. So we are now planning a joint archive. The archive of the NGO Conscience from the town of Kotlas in Archangelsk region is being added as well. This, of course, gives researchers more opportunities. Interestingly, when we started putting together materials from Kotlas, Ryazan and Petersburg, we discovered links between the materials in our names’ register, because Gulag stories would start in one place and end in another, so we are getting a fuller picture now. So as soon as we get more funding we are going to open access to the joint archive. And then we shall allow remote additions to our archives to be made, because now there is a completely new generation who are interested in doing this. MK What generation are you talking about? IF Generally speaking, there have been several waves of additions to our archives. The first wave at the beginning of the 1990s came mostly from the people who had actually been prisoners of the GULAG themselves. The second wave came from the children of these people. Some of them brought objects and documents that they had inherited from their parents as things that were very precious and valuable. Others said: “My children won’t need it, I’d better give it to you.” Yet others brought the objects as things they did not need: “We have to move, there is no place to keep them.” Basically this happens in any museum and sometimes the explanations can be false – people may just be embarrassed to bring things that are of valuable to them, and they come up with an explanation in order to make things easier for themselves. And now we have this completely different generation – they are the grandchildren and great-grandchildren of GULAG prisoners. They bring their materials to us, saying: “Look, what I have found in my grandmother’s chest of drawers!” That sort of thing. These are young people – they are happy to scan the document, they are happy to send it electronically and to write their own annotation to it. Their motives are entirely different – they do not even necessarily want to give their materials to the archive. They want to show their documents and to have somebody explain to them the context in which the documents originated. This is of extreme importance as this is a sign of a new approach to the past. This only started happening in recent years and the enquiries are becoming more and more numerous. The younger generation is demanding an explanation of what the GULAG was and how this could have happened. Their parents and grandparents would answer these questions by saying: “This was our life, this is how we lived.” This is what they told themselves, what they told other people, and the younger generation. The new generation – those who are 25 -30 years old now – want to understand the phenomenon. MK: Could you please tell me about the protest movement that began last December? Irina Flige: I think dating the start of the protests to December is wrong. The atmosphere in the country started changing earlier, in the autumn. MK After 23rd September when Putin announced his intention to become president for the third time? IF Yes. Of course, all through the years of Medvedev’s presidency everybody kept saying: “They are going to swap places soon”. That this was going to happen was obvious to everybody, just as the results of these “elections” have been. But somehow, with all the jokes about the two-headed eagle, or about the two men swapping their names, when it was announced it was just too much. This was a real turning point, a watershed. Because somehow subconsciously we must have thought: “They wouldn’t dare”. Because this was like spitting in our faces. And from that moment the movement began. The movement took off everywhere. Of course it was more noticeable in the big cities, because everything is more noticeable in there. But it was everywhere. My colleagues and I spent August 2011 on Kolyma in Magadan region. There were four of us and we went around the region talking, not just to museum staff and experts, but to drivers, to people staying in hotels, to people we met who were just coming and going, local people in cafes along the highways. We met people from all walks of life. Of course, it was clear that we were not locals. People asked us where we were from, what we were doing. What was remarkable was the tough, even hostile, attitude to Moscow. Moscow for everybody in the provinces is the symbol of state power. Somebody would say: “What have you come here for? To look at the camps? What’s the point of looking at them? They should be repaired so that the whole of Moscow can be put there”. This was not a joke. Any driver, any worker we spoke with would talk to us about the criminal character of the regime, would explain the criminalization of the economy, the mechanisms by which it works. It is all crystal clear to everybody, there’s nothing you can surprise people with. The economic devastation of the rich regions, the destruction of the poor ones – they see it all. The trouble is, it’s not just the rich regions that suffer from the tribute that they have to pay to the centre. The trouble is that all this is seemingly done for the sake of the poorer, subsidized regions, but they are doomed to complete destruction, because they are getting just peanuts from the budget, and are not allowed to develop! These regions have intellectual potential, they have a population that is capable of doing something, they are only lacking in natural resources. Now extracting natural resources is not the only thing people can do! But everything else is prohibited. From Kolyma you can see it very well. People there understand what’s happening in their region. Kolyma is an extremely rich region, but it has been humiliated and is in trouble now. And the people in Omsk, which is subsidized, understand about their region too. You don’t have to have even a secondary education to understand it. You do not have to live in a big city. So the people see and understand everything. But it’s very easy to rig their votes before the number of votes cast reaches Moscow. Of course, things are different in Moscow and Petersburg. What we saw starting back last autumn is an awakening of civil society. This was something we had been waiting for so long. Both in Moscow and in Petersburg there were lots of observers at the December elections. These observers were 100% sure in advance that the elections would be dishonest. But it’s one thing to know something in theory, and it’s completely different to see this happening with your own eyes. This came as a shock. This is something you can’t put up with. When it becomes so concrete and personal, when they know that these are the people who teach their children, then it is no longer a joke. This happened in December. And in this respect Moscow and Petersburg were exactly the same. In both cities what we have seen is that this situation brought forth this wonderful generation. These are people from 25 to 45 years old. This age group provided most of the people who took part in the rallies, the protests and, most importantly, election observers. These people have already achieved something in life, they are middle class. On the whole they are doing well in life. Although their levels of education vary, the majority have higher education – which is another feature of this group. There were very few students - people below 25. Recently statistics about this have been brought together. In Petersburg there were 6,000 observers. Of these, those younger than 25 were less than 10 %, and those over 55 were also less than 10 %. So the group of people that actively supported the protests is neither the young, nor the old, but adults, both men and women. And this was the same in both Moscow and Petersburg. But there were differences too. First of all in quantity. Moscow is much larger. Petersburg is much more compact. In St. Petersburg, observers for the presidential elections began getting organized very early – at the end of January. Because Petersburg is not the capital, those who represent the big political parties, like the Communists, Zhirinovsky’s party, and so on, are usually at a lower level than in Moscow - less intelligent, less educated… And this allowed the Petersburg Association of Observers to become independent of the parties at an early stage. Officially you could only act as an observer in the elections as a representative of a party. But in Petersburg the Association managed to insist that people could take part as an election observer if they had a party observer’s mandate, without actually having anything to do with the party. In Moscow this was more difficult to achieve and people had far more to be in contact with Communists and others, which was not pleasant. In Petersburg the Association proved stronger than the parties. It’s a small thing, but it is important. So the elections are over. It was a defeat, but experience has been gained and the Association of Observers has not disbanded. I should have said that at the end of February before the elections they held an Observers’ Forum, when over 4,000 people gathered at the Pribaltyskaya Hotel. MK How was that possible? IF The hotel is owned by a foreigner. They rented a meeting room with money they had collected among themselves. And then they gathered again, this time with slightly fewer than 2,000 people, and formed the organisation “Association of Observers”. The idea to which they are committed is an important one. It is that the concept of “observer” means the right of citizens to observe everything in the country. They are now collecting documents to register the organization as an NGO. The organisation is district–based: there are city coordinators, district coordinators. This framework actually helped them during the elections. That’s why there were practically no polling stations without observers. Sometimes at a polling station there were several observers, sometimes only one. But they basically covered every polling station, apart from a tiny number in a distant area. MK But why did fewer people take part in the protests in Petersburg than in Moscow? I mean proportionately, of course. Was it out of fear? Or was there more pro-Putin feeling in the city? IF No, no, no. It’s just that, sad as it is, politics is done in Moscow. In all other cities, including Petersburg, people would take to the streets if they are concerned about something that is happening here and now. MK And finally, how do you think the situation in Russia will develop? IF I am not of course a political analyst or a sociologist, I can’t make any professional forecast, and in fact I do not believe in political forecasts. But in Russia I think at the present time there is only one measure for political events: whether blood will be shed or not. Unfortunately, we are on the threshold of these events. I hope, I very much hope that nothing like this will happen. I am not saying there will be enough political wisdom to avoid it or anything like that. I am hoping for a miracle. I hope that nothing like that will happen. I really think we may be on the eve of large-scale bloodshed. One the one hand, can you imagine Putin, who has had to put up with all this since December? He would have rather pressed a machine–gun to his belly and started shooting in all these squares… But he bore it courageously. And he will probably bear it till the inauguration. Can you imagine him bearing it for much longer? On the other hand, people feel deeply humiliated. They won’t be able to bear it for long either – for each individual it’s a personal disgrace. So I am afraid that blood will be spilled when these two impulses clash. For this to happen it will be enough for one rally to be brutally dispersed and people will take to the streets. It is not by accident that the authorities are constantly referring to the Libyan scenario. This is what they identify with – it is their self-identification! It is not by accident that they call the people who are concerned about civic issues “opposition”. So the issue at stake now is not the possible nature of a future regime, or whether in a political sense it’s going to be 3 degrees warmer or 3 degrees cooler. The issue at stake is whether there will be bloodshed - or whether this can be avoided. This is the only issue for Russia today.